Another example of wearable reliquary. The construction is very similar to the IHC reliquary I already made. I assume this was also open-able, slide up one although I did not find information about it. The front panel with a architectural motive of gothic windows was made with a cast. The back panel engraved with a hunting motive - rabbit being chased by three hounds. This is still "work in progress" project but photos already give an idea of how it will look finished. 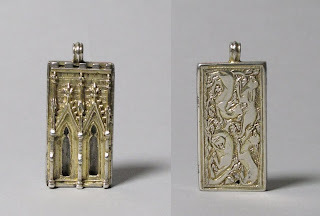 Front and back panel of the pendant. Here are also some photos of the making process. I made the wax model mostly with a "build-up" technique and then made engravings in the background. Some wax, alcohol burner, a few metal instruments and some hours is all what is needed. 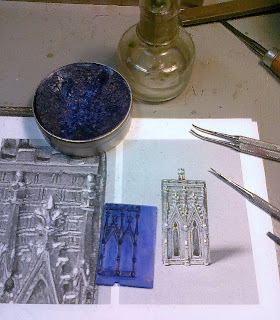 Making the wax model of the front panel. The museum catalogue says that it got also inscriptions on the sides de Sca Barbara de Sco Giorgio [Saint Barbara Saint George] unfortunately I have no pictures or drawings of the inscriptions. That means I will not make any engraving until I obtain some more photos or before I will go for trip to New York and see it on the display myself. If you maybe have some more photos of it please do not hesitate to contact me!